March is fast approaching! As we move into the spring time months some of my favorite blooms are becoming available and I so excited to be offering them in our arrangements. 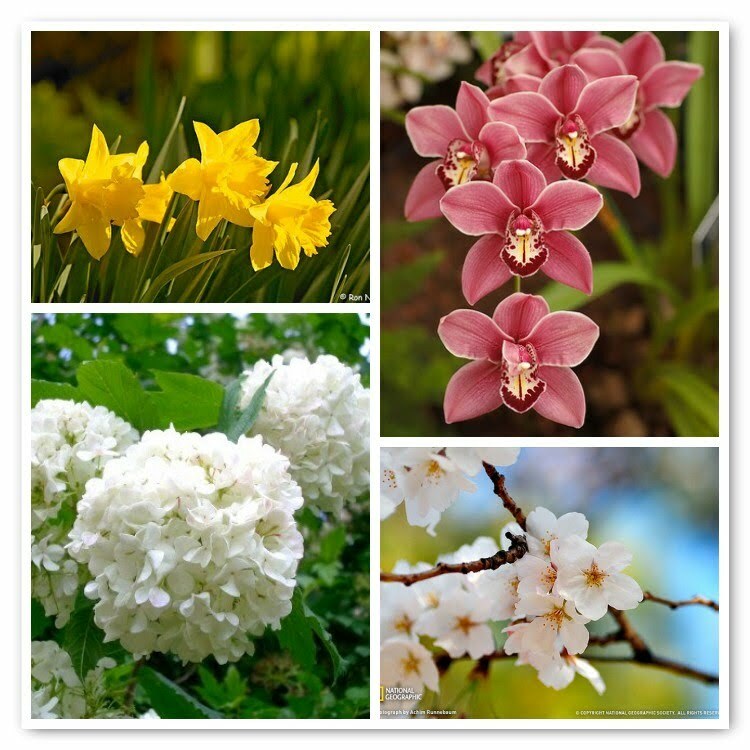 Cymbidiums which come in all sizes and colors are a Hidden Garden favorite we use all year long. The actual cymbidium plants are starting to flourish at the LA Flower Market. An array of colors become available from pinks, greens, yellow, white and burgundy. The stems of bursting with blooms. Daffodils are a cheery March favorite. They are so inexpensive yet in abundance can make such an impact. Clustering 100 stems in a vase is bound to make anyone smile! Cherry Blossoms offer the most simplistic yet beautiful display. All year long clients rave about the magnificent blooms. They are here....in pinks & whites. They are simply gorgeous all by themselves yet when peaking out from a bounty of english garden florals they finish it off just right. Vibrant Viburnum in their little tuffs of celadon to white. One of my favorite spring time blooms! It's a mini version of hydrangea but has a beautiful texture that you can't find in any other flower. 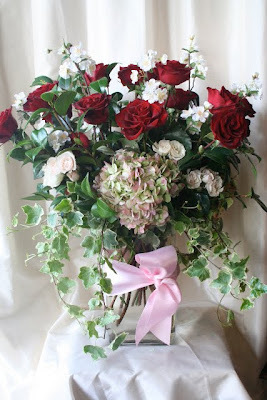 We look forward to sending these flowers out the door for you to enjoy as much as we do. Photos courtesy of Okatplantlover, National Geographic, English Country Garden and Ron Niebrugge. For the last 2 days, our team of designers have been setting up a beautiful display that will be at the Your Wedding Day Magazine Most Anticipated Event. Teaming with Linda Pitelli from Eventful, we are creating a dramatic site for the brides & industry professionals to 'ooh' & 'ahh' about. We'll give you a sneak peak at what are talented artists created this time! New Blog Post For Inside Weddings; How To Get Your Groom Planning! There are so many wonderfully, unique blogs penned by brides, but my post today for Inside Weddings is inspired by all the great grooms in the blogosphere! You have to check out my favorites in my post, "How To Get Your Groom Planning!" A lot of brides don't know how to get their grooms involved, but I give you some tips on how to do it and some benefits that come from including them in the process! Superbowl Sunday....flowers - yes flowers! We are so excited to share with you some of our creations from the Superbowl XL1V Tailgate party at Sun Life Stadium in Miami, Florida. What a week it was! With over 10,000 guests in attendance at this amazing party you can imagine how much time and energy went into the planning. PPW (party planner's west, inc) was the brains behind the operation and we were so thrilled to be a part of the event (once again!). 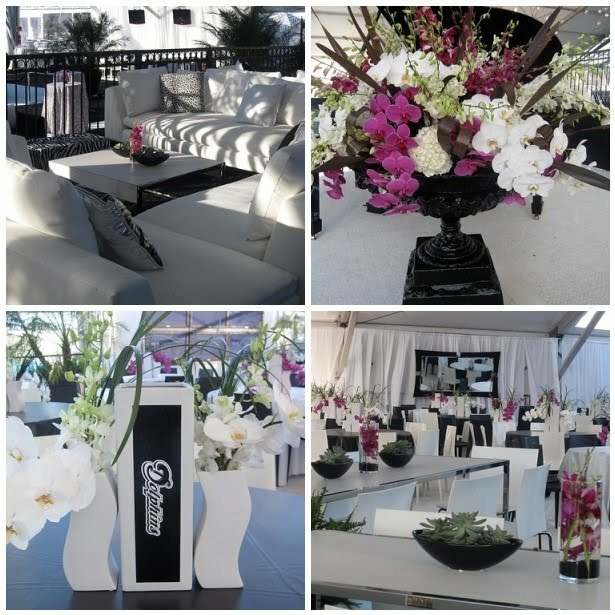 One of my favorite designs was the chic black & white tent for team and Owners at the party. We incorporated an abundant display of orchids in magenta & white tones as well as succulents from a local grower in Miami. Check back tomorrow for the Sunflower Extravaganza! We are only a couple days away from Superbowl Sunday! Take a peek at what we are working on for the tailgate party. 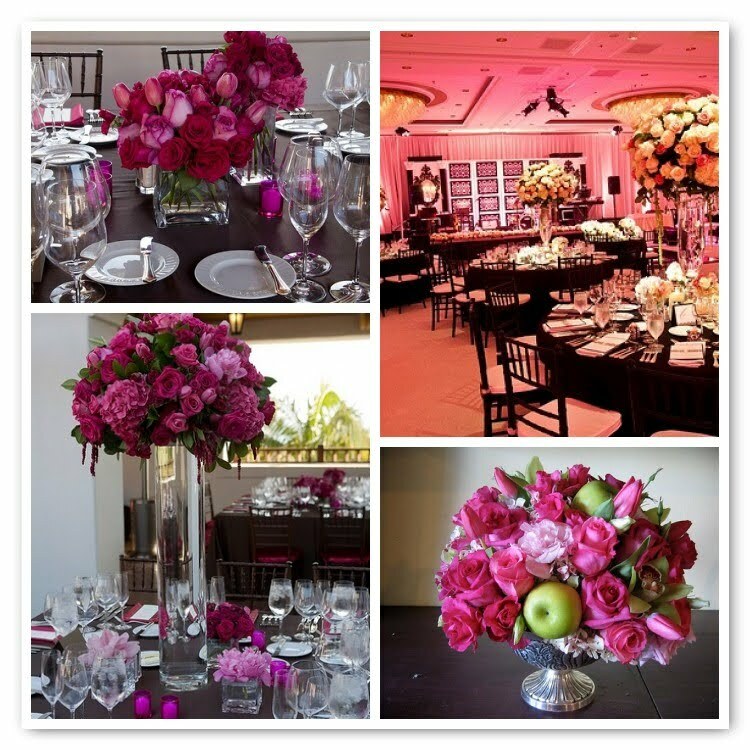 With the chic black and white decor the pop of colors from the florals is the "icing on the cake"! The contrast of black and white really make the colors of the flowers stand out. The tropical feel of Florida served as inspiration for the bright colors. As you can see we are using orange Parakeet Helliconia, Bright yellow sunflowers, green fijis, green dendrobiums. We can't wait to show you the final setting...you're gonna love it! 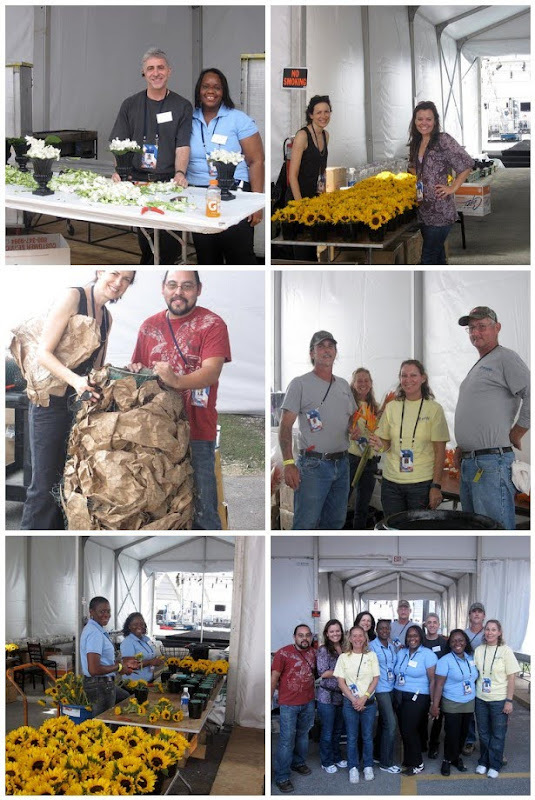 Every Superbowl The Hidden Garden is brought on board to help design the floral decor for the NFL Tailgate Party (last year Tampa, next year Dallas!) Although, we can't fly our entire staff from Los Angeles to Miami (they are in the shop working on two weddings for the weekend) we do enlist the help from local flower shops to help us pull it all together. The NFL is always very supportive of the local community when the Superbowl comes to the chosen city. They love to help the emerging business in the community. The staff from Beautiful Kreations and Touch of Paradise were the choice florists in Miami and became our assisting design team for the set up. They have been amazing to work with and a lot of fun to be around. We have been working hard since Wednesday AM getting things prepared for Sunday's blowout. We are hard at work... stay tuned for pictures of the beautiful arrangements that we have created for the upcoming Bash! New Blog Post For Inside Weddings; The Referral Process! The best way to prevent disappointment on your wedding day is by doing your homework. This means going through the referral process. On today's Inside Weddings post I remind brides how important it is to ask their friends and other vendors for referrals. At The Hidden Garden we work with a lot of talented wedding coordinators, photographers and caterers and are always happy to make a recommendation based on your taste. So, remember just ask and you shall receive a beautiful wedding! Superbowl Sunday is only 5 days away......and we are busy prepping for the big event in Miami, Fl. Every year we are so fortunate to work with PPW & the NFL on the amazing Tailgate Party that is the pre-game party of the year! An invite only affair that will wow the most seasoned party goer! Although we travel from Los Angeles every year to help design the floral decor for the Tailgate Party we couldn't possibly complete the task without some of the local community businesses. 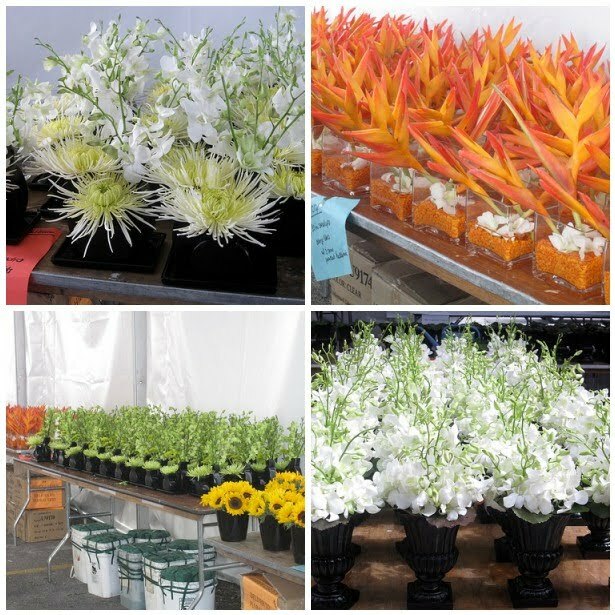 This year Beautiful Creations & A Touch of Paradise are two of the flower shops in the area that will be helping us with our floral designs. Today's our first day on site and we are hitting the ground running....flowers arriving from Mayesh Wholesale are being processed so they look beautiful and fresh for the big day. Here's a sneak peak at the floral selections for the upcoming designs: sunflowers, Parakeet Hellicionia, Makara Orchids, Dendrobiums, Tropical Foilage, Spider Mums, Casablancas....and the list goes on. We can't wait to show you different ways we will incorporate all these elements into their spaces. Prepping is done...and the designing begins in the morning! If you have been following us on the blog and on Facebook you know all about our Valentine's Day Contest! So this is just a reminder to get your stories in soon! If you think you have had the BEST or the WORST Valentine's Day EVER, let us be the judge of that. We are busy reading your tales of love and misery and can't wait to surprise one lucky winner with a gorgeous Valentine's Day arrangement from the Hidden Garden. Do it now! Become a fan of The Hidden Garden on Facebook and post your story. 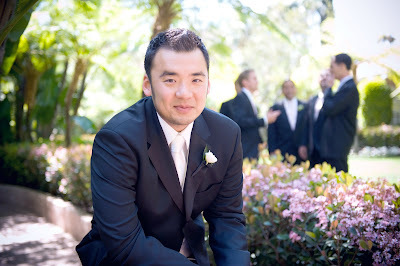 Check out some of the wedding photos we recently received from photographer Marianne Lozano. This bride and groom wanted a simple but elegant wedding that used a rich color palette. 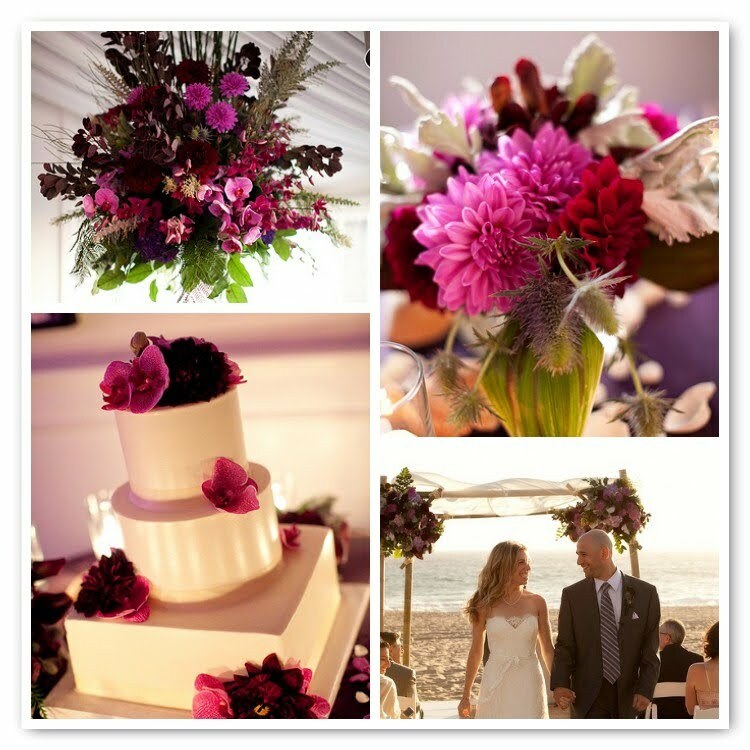 The Pacific Ocean served as a breathtaking backdrop to the jewel toned florals on the chuppah. In the reception the vibe was relaxing and laid back. 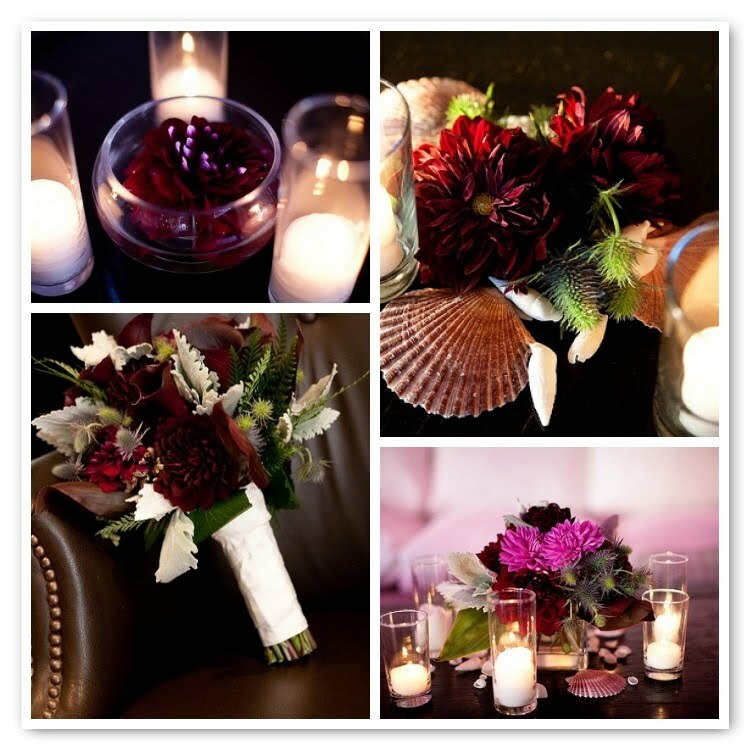 Lounge areas were accented with votive candle holders surrounded by floating dahlias in deep rich eggplant colors. Throughout the wedding you could find subtle hints of the ocean like seashells on the table. The bride opted for a simple bouquet in the same rich deep color palette which made a striking statement against her beautiful white lace gown. The same idea was employed with the cake. A simple, yet elegant cake was transformed into a beautiful delectable dessert by strategically placing a few orchids on it. We are off to Miami tomorrow to start prepping for the Superbowl! Stay tuned for more info.